This development project, now owned by Utah State Senator Wayne Niederhauser and Sandy City Councilman Chris McCandless, includes a hotel, retail and restaurants, office space and a large parking garage. Cullimore says that if current businesses join the CDA they can provide input in ways they would connect their existing businesses with the future project. According to Stojak, the CDA is an effort to facilitate eminent domain. Cullimore says the opposite is true. The CDA is setup to provide existing business owners a voice in new projects and a means of allocating additional tax revenue to specific projects by specific businesses, and the CDA would protect the business owners from any chance of eminent domain. The claim of eminent domain, and the notion that the developers want to acquire the local’s property, according to Cullimore, is far off the mark. But the local business owners have reason to fear. 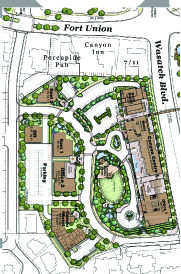 In April, 2011, City Weekly published a story of plans for the redevelopment which replaced all the local businesses in the area with a new “kiss and ride” UTA bus stop, and a parking lot where the Porcupine Pub currently resides. Missing in the plans are the Canyon Inn, Lift House and only a reference to a “new 7-11.” “I don’t know where they got those plans,” said Cullimore. “They aren’t plans that were submitted to the city, we would never accept those plans.” Jim Stojak says that City Weekly found those plans after one of the initial developers, Chris McCandless, left them behind after a meeting. According to the Mayor, plans are moving forward on a design which has no impact at all on existing businesses. None of the local business owners were aware that any plans besides the ones covered by the press existed. So, rightfully, they were concerned. Cullimore says that all business owners should join the CDA or “risk being isolated from the future benefits of the development.” Cullimore says the theory that he is somehow working with the developer and the police to “steal their property” is completely unfounded. However, when Utah Stories asked to see new plans submitted to the city showing that the locals were indeed not removed, as of January 28th plans were not submitted by Chris McCandless. McCandless sent us his plans just in time for press (pictured left). “We don’t want them to relocate, we want them to stay right where they’re at . . . We are proud to have one of the most productive 7-Elevens in the country. We are proud to have such an excellent restaurant as Porcupine Pub in Cottonwood Heights.” Noticeably absent from Cullimore’s praise was the Canyon Inn, which has been a destination for skiers and locals for 42 years. Currently none of the business owners are aware of the new plans on the table. Mayor Cullimore demonstrated his commitment to accessibility and transparency by answering all of our questions and meeting with Utah Stories during business hours. It appears this problem at the least has been caused by very substandard public relations, even if their crackdown on DUIs has nothing to do with the pending development. It’s a nice dream having a town of 34,000 residents comprise a “city,” though impractical due to the the lack of internal affairs oversight that is built into county and state government agencies. A “city” is defined in Webster’s Dictionary as a “large important town.” Before a city can be such, it first needs to be a town. Cottonwood Heights has never been a town. It’s a suburban district divided from its neighbors by arbitrary lines drawn on a map which divide it from neighboring suburbs such as Sandy and Draper. Cottonwood Heights became a city only because it could. The city hall is listed in Google Maps in Midvale, but there is no noticeable difference between Midvale, Fort Union and Cottonwood Heights.